Understanding around interest & hobbies. Interest is nothing but “value for values” and hobby is nothing but “diversion in difficulty”. It is very difficult to understand the difference between these two words. This article will help you to understand the difference while managing interest and hobbies. Reading a Book is an Interest or Hobby? — I do think it is my hobby. What do you think? Let me clarify the definition of hobby — A continuous effort while adopting something and would be static. Interest: A short term effort while adapting to something. Moreover reading a book might be an interest for someone and would be dynamic. 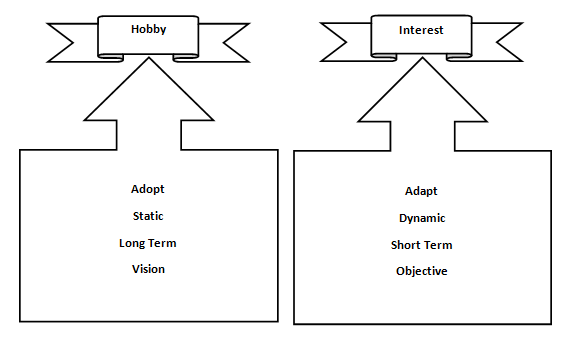 Described above in diagram is a, valuable understanding about hobby & interest with respect of characteristics. Hobbies improve the quality of our lives by opening up our world to new passions and people we meet through the adventures we have. Hobbies improve brainpower by building new mental pathways when you learn something new. They provide an escape from the sometimes monotonous nature of daily life, and they help us learn something about ourselves in the process. They can be a bonding experience, or an introspective exercise, or a way to meet new people. When picking a hobby, see what classes and activities are available near you. Do you live by a dance or yoga studio? Are you close to a lake that allows fishing? Do you have a place where you could create a garden in your yard? The best hobbies are the ones that mesh well with your daily life. Part of the enjoyment of a hobby is the feeling of getting outside of your comfort zone. See what kind of hobbies challenge you to do something new that you wouldn’t have done before. Never been in a yoga class? Unsure if you’ll be able to successfully learn to ski? Never fear! We have articles to get you started and help you take the leap. An interest is the feeling of a person whose attention, concern, or curiosity is particularly engaged by something, or something that concerns, involves, draws the attention of, or arouses the curiosity of a person. Basically, an interest is something one likes to do or something that one has a feeling for. For example, she has an interest in poetry, or he is interested in watching the game. A hobby is something one likes to do in his past time, a spare-time recreational pursuit. It is an action, something one does. Usually, hobbies need devotion; it is something that has to be done systematically. For example, stamp collection or playing an instrument. Interest has a broad scope which includes hobbies. If one has an interest, they may or may not develop it into a hobby. If someone is somewhat interested in something, he may not pursue it actively. For example, he is interested in sky diving, but he hasn’t gone even once. On the other hand, one will only pursue a hobby if he is interested in it. For example, she is interested in classic literature, her hobby is to collect and read old books, or, he is interested in birds, his hobby is bird watching. Hobbies and interests are words that would seem like synonyms or at least interchangeable to most of us. Most of us have varied interests in life, in addition to the job we are doing. When filling up forms for a post in a company, we see a column asking about our hobbies and interests. Hobbies and interests are pursued in one’s pastime. For most people, hobbies and interests are the same, and they talk about them in the same breath. However, there are differences between a hobby and an interest that will be talked about in this article. A hobby is an activity that is pleasurable and people take part in such an activity, in their spare time. For example, some people like to take part in some adventurous outdoor activity whenever they get some leisure time. A hobby is one activity that makes people happy as they are able to forget tensions of their lives for some time. Many people listen to music in their leisure time and are lost in their musical world forgetting all about their worries and problems for the time being. There are others who collect stamps, a hobby that is called philately. Many collect coins of different countries and have a huge collection of old and rare coins of various countries of the world. This is a hobby that is referred to as numismatics. Of course, hobbies can be varied, and there is no limit to the types of hobbies people can have. For some dancing is not just their hobby, it is a passion that they cannot live without dancing. They take to dancing in their spare time, and get inner satisfaction and pleasure out of indulging their favourite activity. The important thing to remember is that a hobby is pursued for fun or pleasure and not for remuneration. Thus, an activity ceases to be a hobby as soon as it becomes a profession or a source of livelihood for an individual. Interest is defined as curiosity or the feeling of an individual for a particular thing or activity. If a subject arouses the interest or curiosity of a person, it is said that his interests lie in that subject. When talking about a man, we often say he has interests in share markets or in sports, whichever may be the case. There are areas of interests for people and there are often questions pertaining to one’s interests in life when facing an interview board. You may be interested a lot in football but still do not play it on the ground actively. This means you read a lot about football and also watch it on TV and stadiums as you are interested in the sport. Similarly, you are not yourself a politician but you are interested in politics and watch political news and current affairs programs on TV avidly.What is the difference between Hobbies and Interests? Hobby remains for fun and recreation, and an activity ceases to be hobby when it becomes a profession for someone. Interests refer to things or activities that a person is curious or concerned about. They are subjects or qualities that evoke his attention. They can be things that someone does as a pastime or a leisure activity or those that he wants to have an occupation in. There are various interests that a person might be enthusiastic about. A person might be interested in things or activities that involve animals, so he might work or find leisure in the care and breeding of animals. He might have interests in the arts so the right job for him would be those that involve working with forms and designs. He can also spend his time and enjoy creating works of art. Hobbies, on the other hand, refer to activities that a person does for pleasure and relaxation. They are usually done during his leisure time or during times when he does not have anything to work on. Collecting, which involves the acquisition of items that interest a person like stamps or things that a famous person owned? Games, which are recreational activities that involve mental and physical stimulation. Outdoor recreation like caving and mountain climbing. Performing arts like singing, dancing, or performing magic. Creative hobbies such as photography or making jewellery and artistic projects. Scale modelling which is the creation of small replicas of certain things. Cooking or the art of food preparation for consumption. Gardening, which can be indoor, water, or container gardening. Reading books, magazines, or comics. A person’s interests can be a source of income or can be something that he just does without compensation. If a person is interested in cooking and likes to create dishes, he can either cook just for himself or his family, or he can make it a source of income. 1. Interests are activities or things that a person might be curious or concerned about while hobbies are things or activities that a person does for relaxation and enjoyment. 2. A person’s interests can be various and may lead to his generating an income or making a living out of it while his hobbies do not have any monetary rewards. 3. Hobbies are usually done during a person’s free time or during times that he doesn’t have to work. His interests can be done during his free time or while working as in the case of having his interests as a source of income.